Feeding Time With The Boozey Swine: Preview: Brunch With Boozey. Happy Valley Festival Sunday 2nd June. Preview: Brunch With Boozey. Happy Valley Festival Sunday 2nd June. 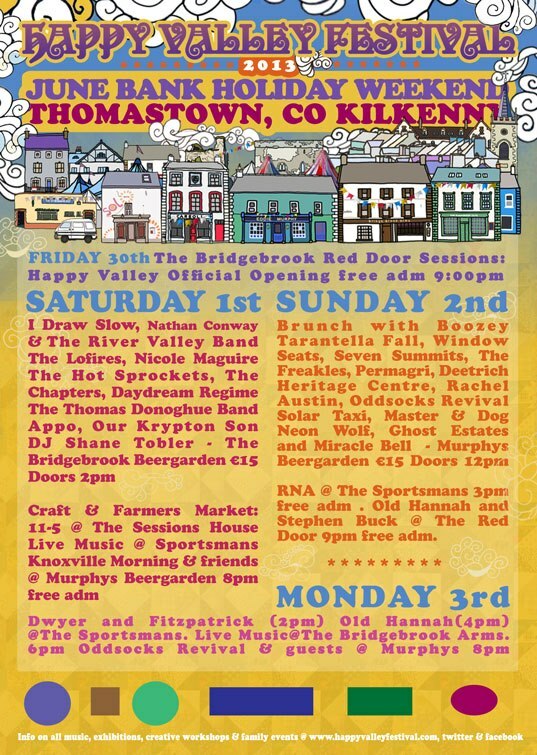 'Brunch with Boozey' at the 'Happy Valley Festival' in Thomastown in Co. Kilkenny. To say that Thomastown is close to my heart would be a major understatement. In the close to 10 years that I've been visiting this beautiful wild town on the banks of the River Nore I've had a lot of the best times of my life and made countless life long friends in the process. The pinnacle of the great festivals on offer here every year is the 'Happy Valley Festival', like everything in Thomastown there's really only a rough guideline as to when it starts and ends but every June Bank Holiday weekend for years I've been making a pilgrimage to partake in and attempt to survive its madness. This year will be no different except I've been kindly asked to kick off proceedings at the infamous 15 for €15 show in Murphy's that takes place all day Sunday with 'Brunch with Boozey' which will entail amongst other things food for everyone who arrives early AND a Sandwich Competition which is open to anyone attending and all musicians playing during the day. All you have to do is bring a Sandwich to the gig and myself and my panel of esteemed judges will decide how it rates alongside all the others. There will be 2 (drink related) prizes, one for best tasting sandwich and one for the maddest sandwich. Of course I'll insist on having a shot of the winners prize with them, it's only fair. Also at some point in the day (sobriety permitting) I'll have a rummage through the pub kitchen, and failing that anywhere else in the town, and construct a Happy Valley inspired sandwich for anyone who fancies a bit of an afternoon snack. Looking forward to seeing you there and sharing in a bit of the joyous madness.